Objective: The study aims to determine the association between apo B levels in mothers and their pre-school offspring. Methods: Anthropometric measurement (e.g. BMI), lipids, lipoproteins, and apolipoproteins (e.g. apo B) levels in mothers and their children were obtained in November 2015 in Buenos Aires. Results: Eighty-four children (42M) aged 5.3±1.6 years and their mothers aged 33.8±7.2 years were examined. The prevalence of overweight was 39.2 % (33) in mothers and 22.6 % (19) in children, and the prevalence of obesity was 38.1% (32) in mothers and 10.7% (9) in children. Multiple linear regression analysis showed that maternal apo B levels were associated with apo B levels in their offspring, adjusted for confounding variables (Beta=0.29; p=0.03; R2=0.25). Furthermore, offspring born to mothers with high apo B levels were six times likelier to have high apo B levels (OR), 5.7; (95% CI 1.3-25.5). 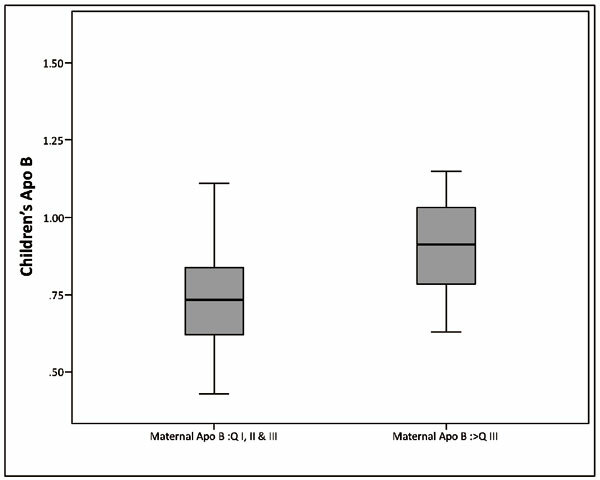 Conclusion: This study suggests that maternal apo B levels were significantly associated with apo B concentration in their pre-school age children. Keywords: Cardiovascular disease, dyslipidemia, apo B, pre-school children, mothers, BMI. Keywords:Cardiovascular disease, dyslipidemia, apo B, pre-school children, mothers, BMI. Abstract:Objective: The study aims to determine the association between apo B levels in mothers and their pre-school offspring.